Greetings, dear readers! I hope this post finds you well and you are staying warm out there! We've got one heck of a storm hitting us here in Northern California, and after two days of constatnt rain, we're having some flash flooding issues. Thankfully there is nowhere that I need to be, and my trek to my local Starbucks is high enough that I barely have puddles to deal with. #Priorities The weather hasn't been particularly cold, but add the moisture and it does feel quite a bit cooler! I've been enjoying some hot chocolate with my oldest toddler the past couple of days, and this was the inspiration for today's nail art post. I picked up Spiced Hot Cocoa and Santa's New Suit from Poetry Cowgirl Nail Polish from The Indie Shop last month, and I finally was able to put them to use on my shorties! Check this out! I'm really digging this design! The nails are definitely on the short side, but after a break about a week after thinking to myself I really needed to file my nails down a little, but I'm actually kind of liking this length. It feels a little limiting for nail art, but its fun for simple colour! 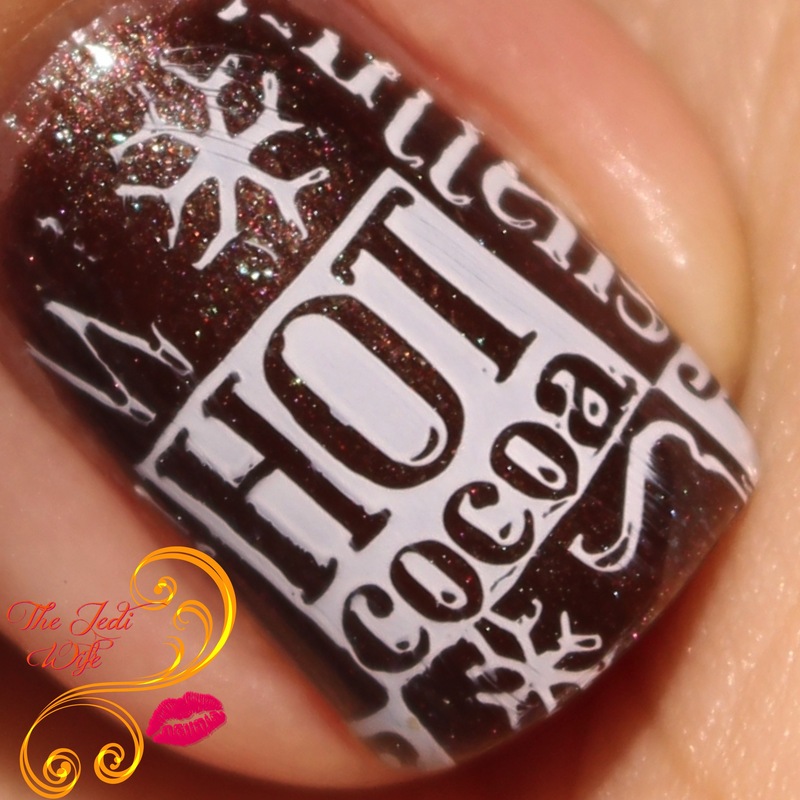 Just having the colour Spiced Hot Cocoa apparently wasn't quite enough for me, and I topped it off with this adorable hot cocoa stamping image from Uber Chic Beauty's Christmas-01 stamping plate using Whiteout by Rica. I couldn't resist sharing a little closeup of this fabulous red jelly polish! Santa's New Suit is from last year's holiday collection, and while it isn't on the shop not (unless I'm overlooking it), if you love glittery red jellies, you really need to track this baby down! I hope you've enjoyed this evening's nail art look! What is your preferred beverage when it's cold outside? I'd love to hear from you! Preferred beverage when it's cold for me is hot cocoa with a few marshmallows and a sprinkle of cinnamon. :) This is such a cozy mani! And I think we are getting some rain tomorrow here in AZ from the storms....today was actually 77! 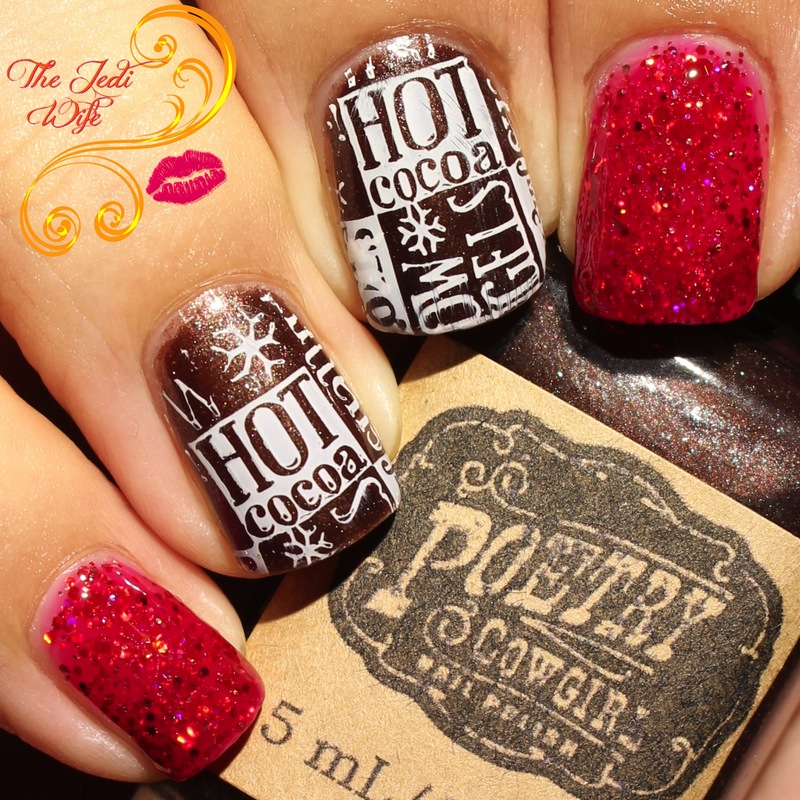 I really do love that hot cocoa stamping image. I need some hot cocoa now. 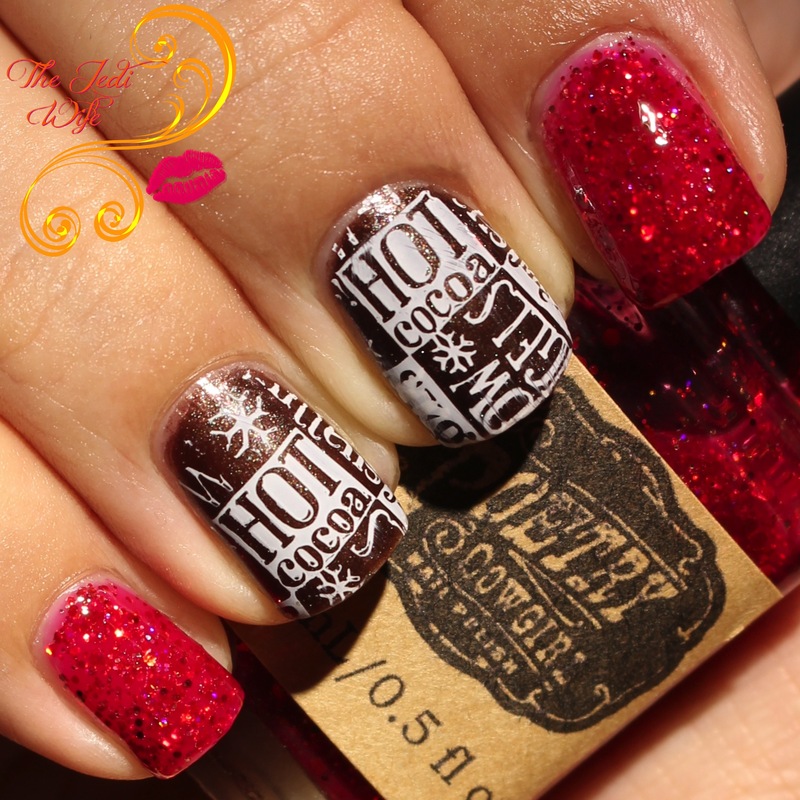 Wow, I LOVE the stamping! I could use a cuppa right now. Ahhhhh! This is too cute!!! I love the red glitter with the brown, never would have thought of that combo. It looks awesome! this is warm and glittery and I love it. This is super adorable! And now I want hot cocoa!